I commented last year on making some of the information contained in these pages available for use in other publications. 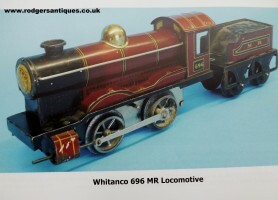 Michael Foster was looking to use some facts in his latest upcoming book number 3 on toy trains. Mike was good enough to let me have copies of his first two books and I have to say what super publications they are. BOOK 1 : British Toy Trains – Covers trains made by Whitanco, Burnett, Chad Valley, Palitoy, Astra and DMC with over 200 photographs and illustrations on 134 pages. BOOK 2 : British Toy Trains – Covers trains made by Betal, British Marx and Wells with over 230 photographs and illustrations on 136 pages. Each book costs £18 + £3.50 UK p&p. 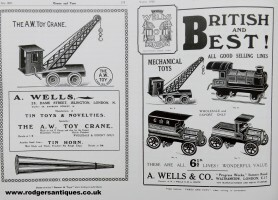 Book 3, which is well underway, will cover the huge range of Brimtoy trains 1914 – 1990. As you can see from the pictures below taken from Michael’s books 1 and 2 the quality of pictures and information included is second to none. 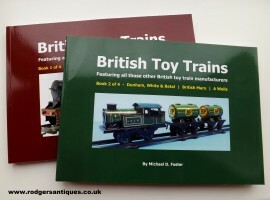 Printed on glossy paper each softback book measures some 29.5 x 21 cm and is a must read for anyone remotely interested in toy trains, old toys or indeed the history of the manufacturing companies involved. OK so I’m playing catch up yet again – since my last post book 3 has been published and having taken delivery of one I have to say it is up to the same high standard as the previous 2 publications ! 2018 has seen some updates to the site, most of these have been behind the scenes so visitors to the site won’t see any visual differences to the appearance of any specific page etc. in future it should be easier to manage from our point of view. Whilst having a few days away this summer I thought I would do a spot of ‘Road Trip’ treasure hunting myself. So when my wife went her way I took the opportunity and popped into any antique shops, bric-a-brac places and local markets to see if by chance I might pick up the odd toy bargain. As usual its the anticipation that maybe, just maybe, the next place to visit would hold a little gem. To be honest I did find one or two items that I was more than happy with. Some I will keep and the others will appear in my Ebay listings in due course. Unfortunately I am not on the BBC payroll so my ‘finds’ would not cover my hotel bills and I had to return to reality and home. There again the majority of so called antique ‘experts’ that you see on these programmes would never make a living either if they had to manage on the profit they make over a week ! It wouldn’t be so bad but they even get the items reduced by six squillion percent !! It would be lovely to drive around the UK both talking a load of rubbish as well as buying it and then complaining when no one actually bids on it at the auction. One of these guys is supposed to be an ‘expert’ on toys and indeed has an auction house that has specialist toy sales, I don’t think I have ever seen him make a profit yet ! – you know the one I mean. Better leave it at that I am starting to sound like Victor Meldrew now. Still I enjoyed rummaging around these places and talking with the owners and look forward to doing it again on my next away days and you never know that elusive gem might just be waiting for me to come along. 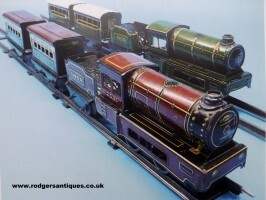 I have recently been informed by Michael Foster that Book 4 of his super series on British Toy Trains has now been completed. Mike was good enough to give me a credit in his earlier book 3 for info taken from my pages on Wells Brimtoy, something that I was more than happy to do. Book 4 is now available and covers trains made by Brimtoy from 1945 to 1991, as well as various small companies. 165 pages packed with info along with over 350 photographs and illustrations. Just a line to say a big thank you for all your ‘Good Wishes and Seasons Greetings’ we received for the upcoming holiday period and the New Year. May we at rodgersantiques in turn wish everyone the same and lets all look forward to some good collecting or selling, depending on your point of view, in the New Year.